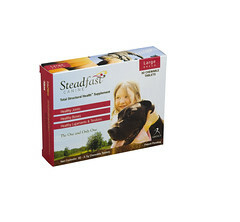 Thank you to everyone who entered to win the Steadfast Canine Joint Supplement! Steadfast Canine is a unique formula for dogs specifically designed to support normal mobility and ease discomfort. Congratulations to Pam and her pack! Thank you again to everyone who entered... stay tuned for our official Steadfast Canine review coming soon! Congrats to Pam. Hope it helps.